Barry Manilow's unparalleled career encompasses virtually every area of music, including performing, composing, arranging and producing. 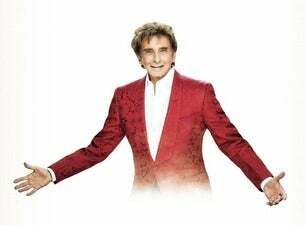 A Songwriters Hall of Fame inductee, Manilow has triumphed in every medium of entertainment. With worldwide record sales exceeding 85 million, he's ranked as the top Adult Contemporary chart artist of all time with over 50 Top 40 hits. Manilow is known for his classic hits such as Mandy, Copacabana, Can’t Smile Without You, Could It Be Magic and many more. Due to overwhelming demand, the Grammy, Tony and Emmy Award-winning pop superstar has announced three new UK arena dates for September 2018 (in Leeds, Manchester and Birmingham), in addition to three shows at London’s The O2 Arena. Also announced to appear with him as special guests are Collabro, the world’s most successful musical theatre group. Hailing from the UK, they have performed to standing ovations across the globe, from the US and Canada to Japan.